Quick release skewers: Helping bike thieves for 90 years! Someone made off with my front wheel and I’m really angry. It’s not that it was a particularly nice wheel, but I did find it very helpful while riding. I don’t understand – why steal just a below average wheel? I went to craigslist to try and find my wheel, or just to buy a replacement, but there aren’t a lot of wheels up there so it doesn’t look like they’re stealing them to sell them. What gives, and what can I do to protect my replacement? – Wheel-less In Sacramento, Help! Ah, yes. This situation is known as the dreaded “bike prowl” – where a thief picks a piece or two off of your bike, leaving the owner stranded and with a sometimes difficult replacement situation. There’s a lot of bike theft behaviors that I can’t explain, but this one is pretty easy. Bike thieves “prowl” bikes for parts to build complete bikes. The most common situation comes about when two compatible bikes in close proximity are locked differently, enabling a thief to quickly assemble a complete bike. Since the 80’s, most road- or commuter-style bikes standardized on wheel sizes and fitted bikes with “Quick Release” (or QR) skewers to allow for rapid, tool-less removal of wheels for transport or repair. The design also helps the rider apply added torque to secure the wheel without risk of stripping hardware. This nifty invention is a great convenience that thieves capitalize on. The scenario plays out like this. The rider of a “red bike” locks their frame and rear wheel with a high-quality lock to a secure rack. The rider of a “blue bike” is less familiar with proper locking and simply locks their front wheel to a rack nearby. Both are equipped with QR skewers. The thief simply liberates the front wheel of the red bike and walks over to the blue bike, wheel in hand. A few turns of the blue QR liberates everything but the front wheel of the blue bike, they install the red wheel and ride away! You’ll occasionally also see bicycles from time to time without saddles. QR seat clamps also became popular, to allow a rider to make small adjustments in the saddle height conveniently without tools. A popular anti-theft tactic that emerged around the same time was for an owner to release their saddle in an attempt to deter theft – sometimes not locking the bike at all! Of course, the same scenario plays out here where the thief simply liberates the saddle from a nearby bike, inserts it into the unlocked bike and rolls away. The good news is that there is a line of defense against QR-based bike prowls. The best is to get rid of the QR hardware on your bike! In general, the category of products that are designed to replace the QR components standard on most bikes are referred to as locking skewers. Most urban bike shops these days will carry at least one solution and will be able to share some opinions. In my personal research and usage, I’ve landed on 3 products that I like, each with strengths and weaknesses. The cheap-and-easy approach is to get some bolt-on skewers that require tools. An inexpensive option is the Delta Axolrodz Bolt-On Hub Skewers, but there are several others out there that are similar. While different variants require different tools, they all work on the same basic principle – by removing the QR, you’re adding risk and complexity for the quick-and-casual tool-free prowl. The downside is that most pros are going to have the tools in their bag to defeat it, so if they have the time and want the wheel, it’s still quite easy. The next level is to go with a keyed locking skewer. These are skewers which require specialized tools that are paired (somewhat) uniquely to the specific hardware on the bike. In this category, we’re fans of the Pinhead Bicycle Locking Skewers. What’s terrific about this approach is that the keyed hardware allows to protect wheels, saddle and stem/fork all with a single approach and key. The downside to these keyed approaches is that you need the key to change a flat, so it’s something else to carry. (PS: Don’t leave it in a saddlebag like one recent victim reported having done!). Another thing to consider is that if you have multiple bikes, you’ll need to have different keys for different bikes. The newest product to the party is the ABUS NutFix Quick Release Bicycle Wheel Skewers which fall into the category of gravity locked skewers. This clever category essentially requires your bike to be rotated into a specific orientation (upside-down or sideways) in order for the skewer to release. One problem with this category is that most of the solutions have essentially been QR skewers that only function if upside-down. The problem this introduces is that the skewers appear to be QR and therefore thieves (and sometimes mechanics) will try to release the wheel, often destroying the skewer. ABUS combines gravity with bolt-on, hiding the hardware with caps that can only be removed with the bike laying on its side. While an elegant solution (that even comes in multiple colors), these too are imperfect. First, rotating the bike might be possible depending on what you’ve secured to. Second, you need to carry a tool to fix a flat. Another approach to defeat the prowl is the accessory cable which is essentially a cable lock with a loop on each end that can be secured to your primary lock and then can be looped through the saddle or front wheel. This can buy a little bit of time over the QR by requiring the thief to clip the cable before releasing the wheel or saddle. Remember though that the primary tool of the trade is bolt cutters! There’s a slew of DIY solutions out there are well, one of the more popular is using an old bike chain as a tether between your saddle rails and rear triangle to prevent a saddle from walking off. The final note on locking skewers is to consult with a bike mechanic or manufacturer if you’re unsure if these products are appropriate for your bike. It’s very important to make sure that you torque the skewers appropriately to keep the wheels safely affixed (taking care not to strip the hardware). WISH, hope this answers your question and that you’re rolling again soon! 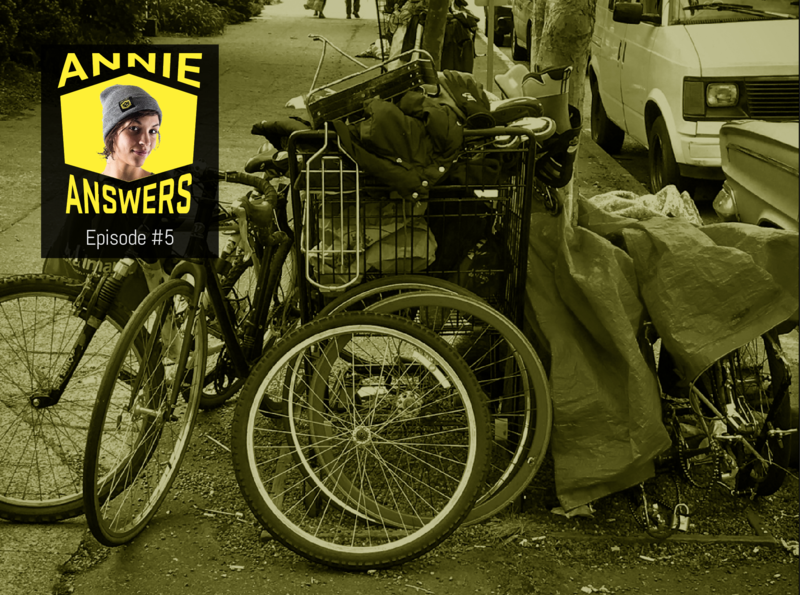 Each week 529’s very own Annie Rhyder answers your questions about bike theft and bike security. To get your question featured, drop her a line at: annieanswers@project529.com.